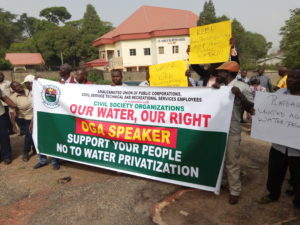 Civil Society Organizations (CSOs), Labour Unions and other Concerned citizens, yesterday, 16th April 2019, held a protest at the Plateau State House of Assembly over an alleged Executive Bill for a Law to provide for the Privatization and Commercialization of Plateau State Water Sector and Other Related Matters. The Protest REALITY gathered came as the Bill was slated for Public Hearing yesterday. 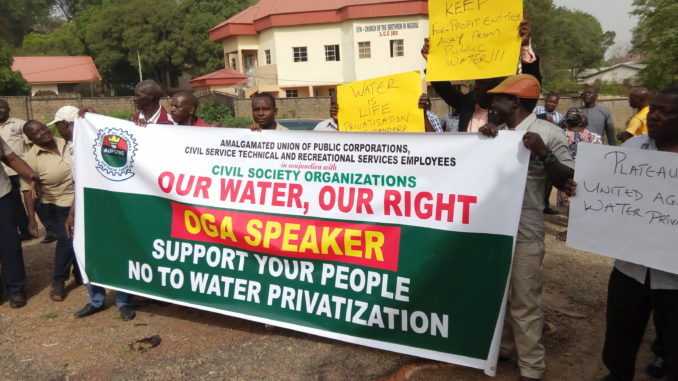 According to documents made available to REALITY by the protesters, the Bill intends to commercialize and privatize the water sector in the state for effectiveness and productivity. However, the public hearing could not hold as a result of the induction training for the members elect for the 9th Plateau State House Assembly, holding at silk suites in Zarmaganda, Jos Plateau State. 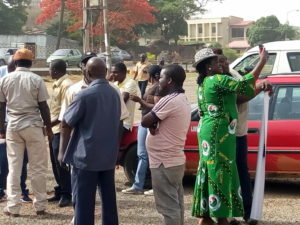 The protest, which held outside at the Assembly complex, was led by the Amalgamated Union of Public Corporations, Civil Service Technical and Recreational Services Employees (AUPCTRE), Civil Society Coalition for Good Governance as well as Environmental Rights Action/ Friends of the Earth Nigeria. The various bodies kicked against the proposed Bill, as they qualified the Bill to be inhumane and insensitive to the plight of the Plateau Citizens and the Nigerian masses. According to Mr. Ayeoribe Emma Akin, the HOD Industrial Relation/ Organizing, Amalgamated Union of Public Corporations, Civil Service Technical and Recreational Services Employees (AUPCTRE). 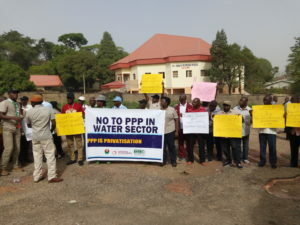 “As a union in collaboration with civil societies we are here to inform the House Committee, to reject the Bill, as it is absolutely against the people that elected them to protect their interest and to also inform them that the people of Plateau state are not in support of the Bill, and we call for rejection, particularly the aspect that has to do with Public Private Partnership (PPP)”. “Water as a matter of fact is a human right, it is not an option. If water is privatized, what again is left as a responsibility of the government to the people, since they have come up with the argument that roads, security lies in the purview of the Federal Government. Water is recognized as life. You can live for days without food but cannot survive without water”. 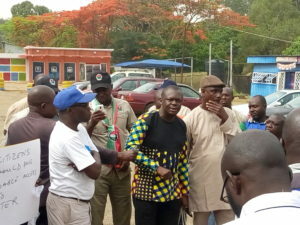 Mr. Steve Aluko of the Civil Society Coalition for Good Governance, at the protest venue, also reiterated that, “The United Nations has accepted that water is life and the government according to the Constitution is to protect lives and properties and also distribute the national wealth of the country. We are kicking against the Bill because of the privatization component, as it is profit driven to the detriment of the masses”. 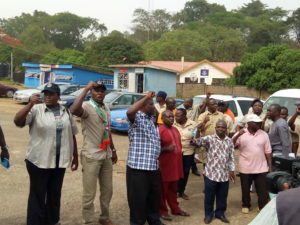 He further stated that the Governor in his campaign for second term promised to support the people, but wondered why such a Bill should emanate from his office. He urged the Members of the House to make sure the Bill do not see the light of the day and encouraged them to see the Civil Societies as partners in progress. 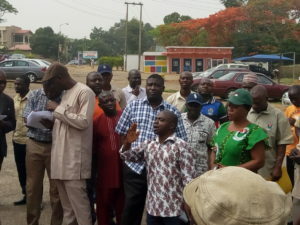 Despite the fact that the public hearing could not hold, Aluko while addressing the crowd present, assured the members of the public that the civil societies and other public unions are always available when a new day is communicated by the House.